Last July, Pinnacle hosted the very first Ninja Games giving Ninja athletes a chance to showcase their skills while also learning some new ones. This December, Ninja Games will have a new spin on it. Ninja Games will consist of a timed score within age groups. Ninjas are divided by age group in separate competitions. Ninjas will have three different courses to run. They will have time to practice each course and will have 2 runs per course during timed competition. The three courses will all have different skill focuses such as strength, speed, agility, coordination, etc. Participants will run each course twice and the fastest time of the two runs will be kept. Ninjas will also have time additions for misses on different obstacles within each course. 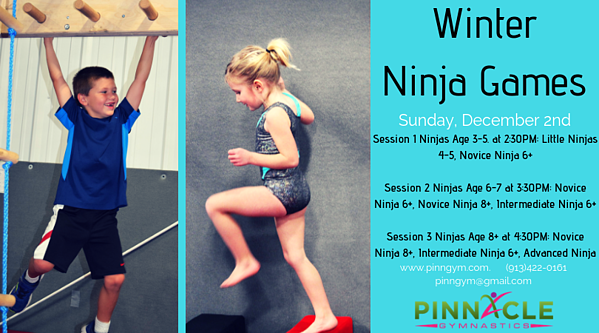 Ninja course plans will consist of swinging from ring to ring, climbing down a peg board, climbing up our climbing ropes, dive rolls, and attempting to conquer our warped wall! Ninjas will aim to complete different obstacles without making mistakes such as dropping to the floor while climbing through the hanging obstacles or getting to certain points on the climbing rope. For each mistake, ninjas with have five seconds added to their course time. Completing the courses quickly is key, but not so quick as to make mistakes on the different obstacles. 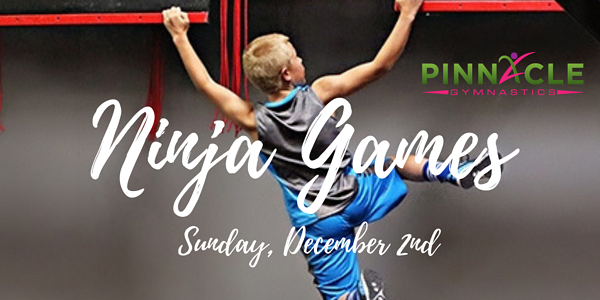 The ninja with the fastest time on each course will be the course winner and the ninja with the fastest overall time with be the Ninja Games Champion! To participate in Ninja Games, Ninjas must be enrolled in a Pinnacle Ninja Class. Click here for more information on Ninja classes. Ninja Games enrollment is still open! Come out and become a Ninja Games Champion!